It’s a warm and busy fall in Palermo. Like a thunder I get noticed there is an opportunity to join a long term volunteer project in Vietnam, thanks to CESIE and Sj Vietnam, the two Ngo’s which had created the project. It sounds more than amazing, then that’s why I applied. After Santa’s coming, in the middle of January, I was ready to leave, so I left Palermo as well. The arrival day in Vietnam was a cultural shock. People say that’s the expression you should use when you literrally get upside down because you see something you never seen before, something that is different from what you have seen before. Skyscrapers and jungle, grey sky and lakes like mirror made of gold at sunset, rivers of moped and motorbikes floating on the road. Hanoi, in just one world. I received training, I joined the celebrations of the lunar new year and I moved to my volunteering place. There, I spent four of the greatest months in my life, at the school where I taught English. 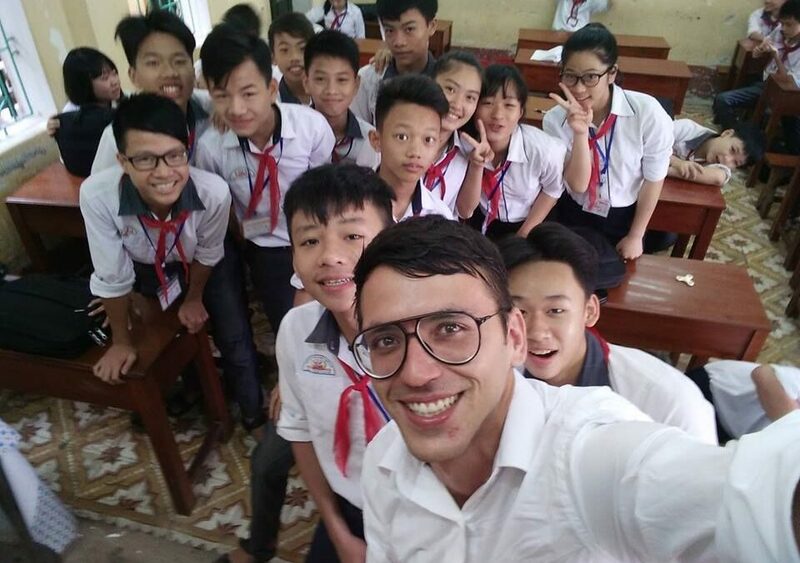 You might be sad by standing million meters far from home, but when you face a classroom full of smiley faces you forget everything , you start to realize that your contribution in terms of happiness in the world, even if small, matters. For you and for them. Making network and meet new friends is something bring to you automatically when you achieve the awareness about what you do, about your motivation, about the reason made you move so far. With the other volunteer we also organized workshop about inclusion, social responsability and cultural engagement in the process of changement toward a better world. Or something like that. Volunteering as a mean, for being responsible, to change the world better. This experience gave to me a lot, I’m so grateful for fhe opportunity I had, it helped me in being more confident, made my head brighter on what I would like to do in my future. Also, the contact with such a different reality, sometimes even a background that is really different in term of wellness of the people, due to extreme poverty conditions, touched me. I was able to help the people in those conditions throught different actions we held as the purpouse of my project, but still a lot remains to do. After the project finished ,I came back home. Now I have memories so beautiful about my trip that I’m scared about looking back, turn my head to the past. Therefore I’m looking forward, straight to the future, concretly choosing my direction in the present as a duty to be an actor of positive change in the society where I live.